Port City Brewing Company – Fun Events! 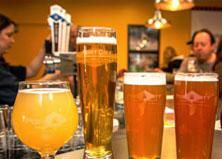 Did you know that Port City Brewing Company (3950 Wheeler Avenue) has a host of fun events this summer? Here are just a few of their offerings! On Tuesday, July 21st from 7 – 9PM they are offering a yoga class where you will be guided through basic and advanced yoga poses. You will also learn breathing techniques to eliminate physical and mental tension and stress. The $15 registration fee covers the class and a post-class pint. Sign-ups are at the Port City website (www.portcitybrewing.com). 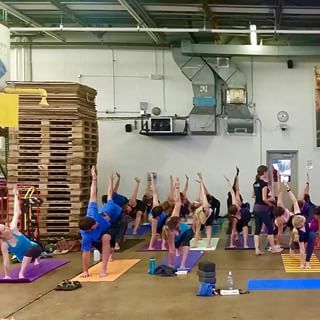 The class is in the brewhouse where temperatures fluctuate so wear layers and bring a yoga mat, water, and towel. All levels are welcome! Then, enjoy the Port City Tasting Room until 9PM. Come out on Monday, July 20, 7PM to take part in the 1, 3 or 5 mile fun run that takes off and returns to their Tasting Room. You will enjoy running a pleasant route, at your own pace, through a park and on a trail along the water of Holmes Run. You will run with a fun group and have support from the Pacers Running staff. Then get some carbs after a fun workout. It is a win-win situation! Join them for the 1st Barrel Aged beer in Port City history! Their 1st anniversary beer, Colossal One, has been taking a long nap in Woodford Whiskey Barrels. They will wake it up and throw a party in its honor! They are celebrating its awakening July 24th with a tapping at 5:30pm! Sixth Engine, Town Hall, and Boundary Stone will be providing small samples of food for the evening. Check out their website (www.portcitybrewing.com) for more exciting events!